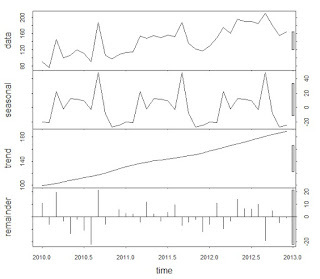 In the previous article of this series, we explained Double Exponential Smoothing method, also called Holt's method for time series forecasting. Now we are taking up TES also called Holt Winter's Method. Once we are done with this article we are all set to learn ARIMA. You HAVE TO read the following articles before reading this one, else it would not make much sense. 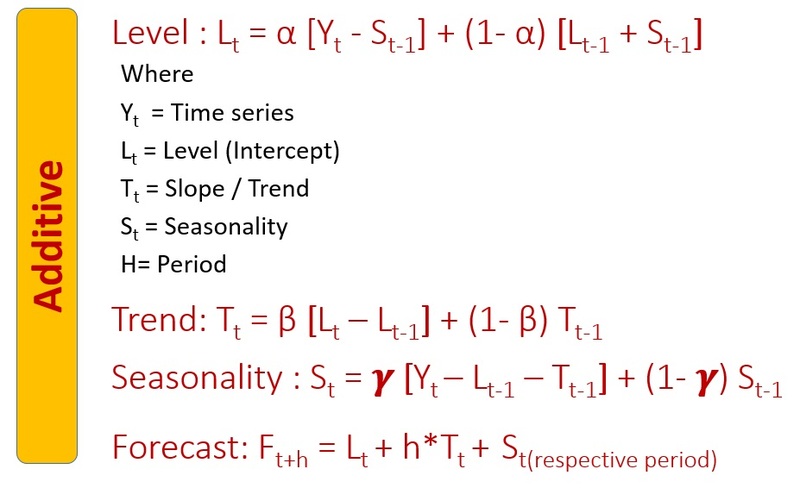 The method is used for a time series with SEASONALITY and a TREND, such series are generally interesting as we would learn to deal with trend as well as Seasonality, so let's learn it. Please download the file to understand the calculation of TES better . 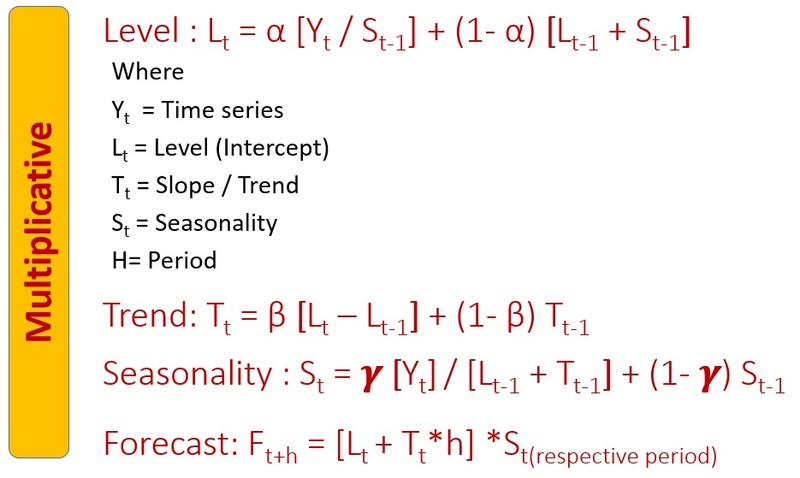 In TES method, first we need to check the presence of seasonality and trend in the time series and then we check the nature of trend. 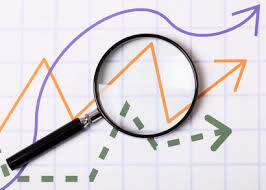 The trend can be either ADDITIVE or MULTIPLICATIVE in mature. We have illustrated the same in sheet "Additive or Multiplicative". 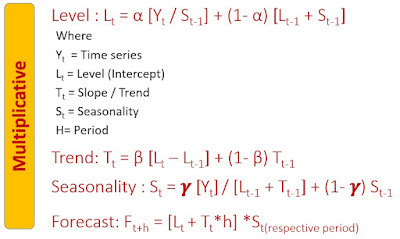 We need to use the equation according to nature of the trend. 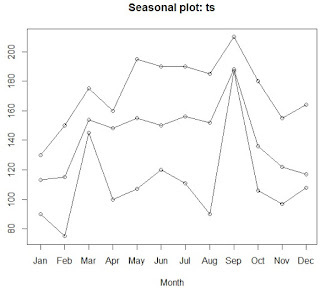 You can see that, calculations of Level, Slope (Trend) and seasonality for first observations i.e. in cells F3, G3 and H3 of sheet TES Calculation are exceptional, second equation onward equations as shown below have been used. 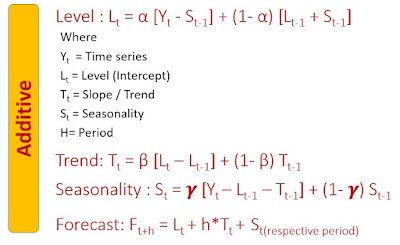 In the forecasting window, formula is different, as the last observation's Level and Trend are used for forecasting along with Seasonality of the last occurrence of respective month. The value of α, β and 𝜸 lies between 0 and 1. Rest remains same, you need to check MAPE for accuracy of forecast. 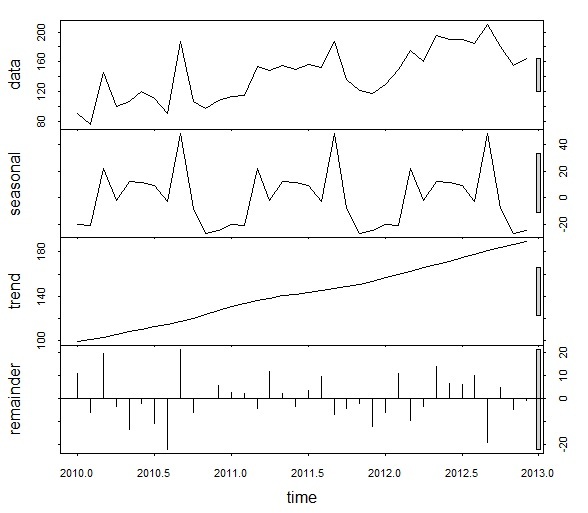 Proc import datafile = "G:\AA\Time Series\TES sales.csv"
# In these plots, we see if the series move together or not. If they do, they are seasonal, well in our case, definitely there is definitely a seasonality. 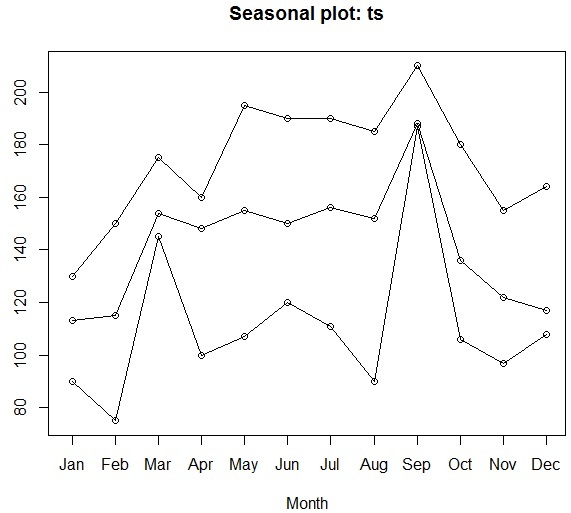 Not showing here as we have shown these plots earlier.